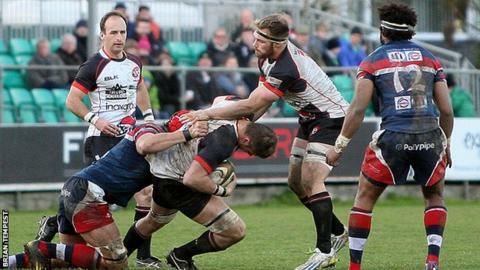 Cornish Pirates boss Ian Davies was unhappy after his side threw away a 20-point lead to lose 31-30 to Doncaster in the British and Irish Cup. The Pirates conceded three tries in the final 20 minutes as Doncaster won Pool four and guaranteed themselves a place in the quarter-finals with a game left. "We did everything we could to lose the game," Davies told BBC Radio Cornwall. Pirates must win at Bedford next week and hope other results go their way if they are to make the knockout stages. Dual-registered Exeter Chiefs fly-half Laurence May missed a second-half penalty which would have won the game, but Davies was quick to absolve the youngster of any blame. "People will dwell on the missed penalty, but we were taking on water before that. "It shouldn't have come down to that, we should have closed the game out a lot earlier. Yes, he missed, but the same guy won us the game against Cross Keys," he said. "It's a thankless task because you're either hero or zero. He's going to be cut up about it, he's an 18-year-old boy, I thought he had an outstanding game apart from that, and he'll learn from it." The Pirates boss believes his side's progression into the quarter-finals could instead hinge on the decision to dock the club the points from their win over Bedford last month. "It's going to be difficult, we go to Goldington Road, we've not got a great record there and they've had a cracking win away at Cross Keys," Davies added. "If we go through, great, if we don't, it's probably down to the points deduction rather than today's slip-up that we're not going to go through, so I think we've got to look at our whole game."